Tasty Thayir vadai is an awesome appetizer loved by all. Often we are passionate towards hotel Thayir vadai , but some times it is sour and not up to the mark. 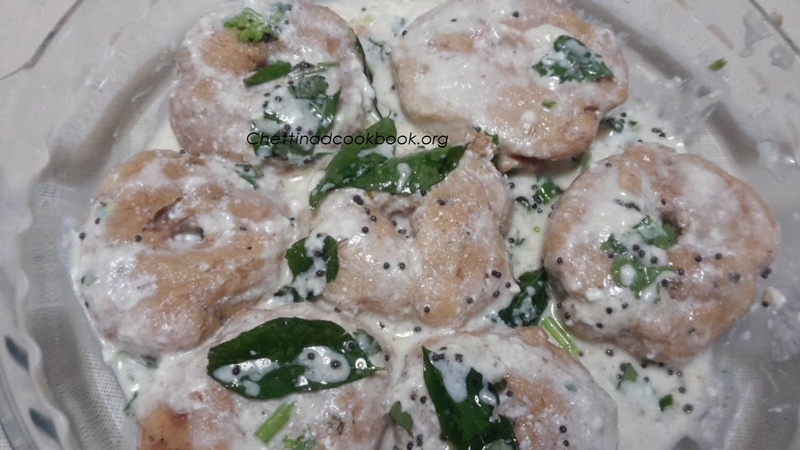 This simple recipe can be done at home in minutes with the left over vadas, Sweet,mild spicy and sour with crunchy boonthi’s on top, aromatic with coriander leaves and hing.Healthy and tasty thayir vadai is famous in north side of India. 1.Boil 2 cups of water with 1/2 tsp of salt ,switch off stove and add Vadas in it,let it get soaked for 10 to 15 minutes. 2.Drain water,place it on a wide serving dish. 4.Heat pan and temper with “To temper” ingredients,add chopped curry leaves,green chillies and saute for a while. 5.Add these to the vada sprinkle some boonthi, few drops of dates syrup,chilli powder and chopped coriander leaves on top.